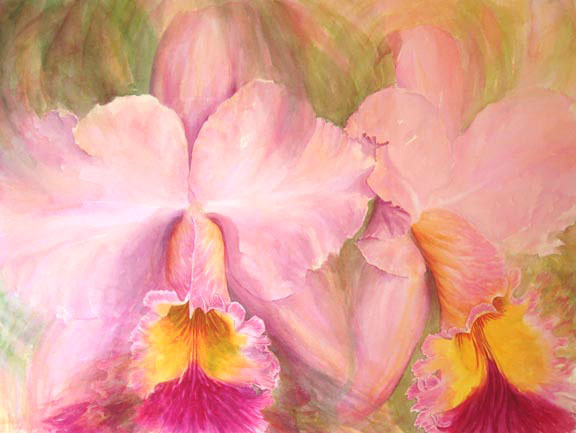 Original watercolor painting of the Cattleya orchid hybrid Brassolaeliacattleya George King by Rose Ganucheau. This painting is one of a series of art works that explores the way we "visualize" the world around us. The eyes are constantly working with the brain to decide what and where an object is. Very little of our visual field is focused on detail. The colors in this cattleya are a painters delight, with the cool pink blending to shell-pink. Of course, with cattleyas, the amazing perfumes sometimes completely overwhelm all my other senses, and I have to just stop painting and smell! Work, Full Sheet: 21" x 29"
Frame, Deep Gold, approx. 30" x 38"
Limited Edition: Only 100 prints will be produced at the same size as the original work (21" x 29"). Each print is signed and numbered by the artist, and is available for $240.00. (plus shipping).